Flies often attack open sores and wounds on dogs and horses. There they lay their eggs causing infection and enlargement of the affected area. 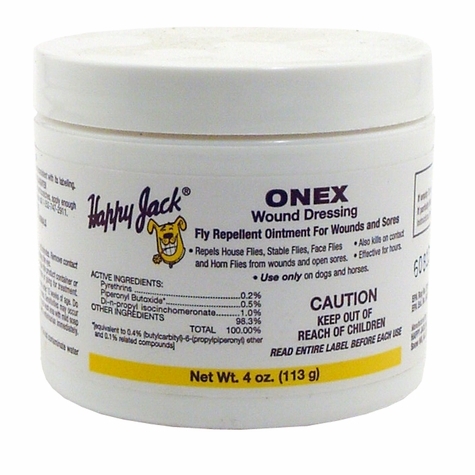 Onex repels the adult flies and kills the hatching larvae which allows the skin to heal. Onex is effective against house, stable, face and horn flies. Effective for hours. Use only on dogs and horses. Contains Pyrethrins. 4 ounce bottle. Do not apply near eyes and mouth. Apply sparingly around ears. Do not apply over cuts, wounds or irritated skin. Use daily. Avoid eye contact. Not for human use. Wash hands after using and before eating, drinking, chewing gum, using tobacco or using the toilet. Do not use on animals younger than 12 weeks of age. Keep out of reach of children.